There is no industry standard for footwear sizes. For example, a size 8 by one footwear manufacturer might be different from a size 8 produced by another. 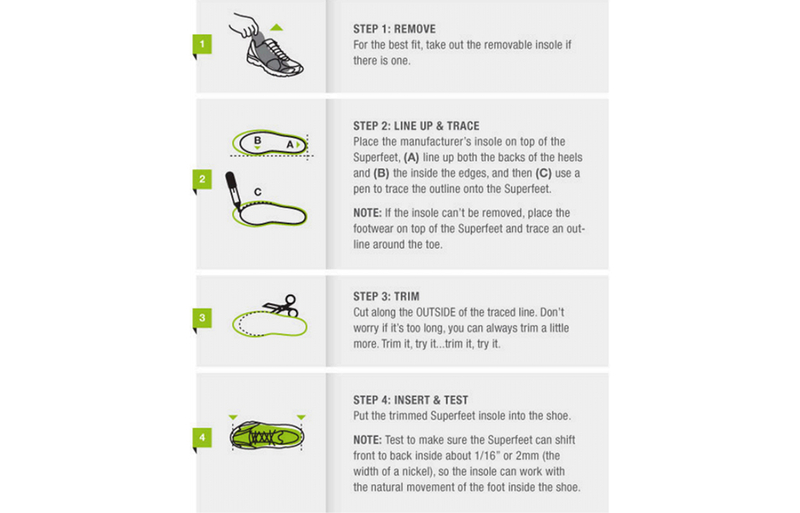 That's why Superfeet makes full-length insoles in size ranges (typically spanning 1.5 sizes) to handle the variations. You may need to trim your insoles to fit in your footwear. - Check if your heel fits inside the Superfeet heel cup, and not over the edge. - If either the heel cup or the insole is too narrow, go up a letter - size. - If your toes extend beyond the end of the foam forefoot, go up a letter - size.